NEWPORT BEACH — Two mega-yachts will call Newport Harbor their home-away-from-home for two months beginning Aug. 26, following the Newport Beach Harbor Commission’s approval to allow the vessels to moor in the harbor on a temporary basis. The two limited-time mega-yacht moorings will serve as a “test run” — in an effort to accommodate a growing number of owners of 100-foot-plus yachts who want to visit Newport Harbor. At the Aug. 14 meeting, the commission in a 5-1 vote approved a measure to allow the 216-foot motoryacht Invictus and the 130-foot yacht Marama to moor in Newport Harbor for two months. A three-member Harbor Commission subcommittee had been formed to review a request made by Dave New of Basin Marine at a July 10 meeting, to make space available for a 216-foot visiting yacht. Commissioners asked Harbor Resources staff members to work with New to figure out how to accommodate the visiting Delta tri-level mega-yacht. Subcommittee members Avery and Dave Girling, along with New, met twice with the city of Newport Beach’s Harbor Resources staff to formulate a recommendation. After discussing concerns about harbor depth, the subcommittee agreed on an appropriate location for the vessels — and specific conditions. Preparing temporary mooring space for the vessels is aligned with the commission’s goal to “promote Newport Harbor as a preferred and welcoming destination for all to enjoy, including both large and small vessels.” According to staff reports, the harbor has traditionally provided mooring and dock space for boats ranging from 20 to 80 feet in length. Invictus and Marama will be moored (at separate times) in the Turning Basin near the west end of Lido Isle — the only area suitable to accommodate vessels of their size. The location served as a temporary anchorage during the recent Newport Harbor dredging project. Invictus is expected to stay in the harbor off and on from Aug. 26 to Oct. 31, mooring at the temporary location while cruising in Southern California. The boat carries a 44-foot beam and a draft of 13 feet. Marama will moor in harbor between Sept. 25 and Sept. 30, to be present during the Sept. 26-29 Lido Boat Show. Harbor Commissioner Karen Rhyne cast the lone dissenting vote on the large yacht moorings, questioning the boats’ ability to maneuver through the harbor, where the mega-yachts will pump out and how the boats’ diesel exhaust will impact residents. She also was concerned about the length of the mega-yachts’ stay in the harbor. Two Via Lido residents asked the commission not to set a precedent of bringing big boats into the bay. Increased traffic to the basin, limited harbor depths and impact to views were among the two residents’ concerns presented to the commission. According to staff reports, the owner of Invictus will install a mooring with light attached at a location approved by Orange County Sheriff’s Harbor Patrol, at the owner’s expense, with installation performed by a local mooring contractor. The mega-yacht will drop a forward anchor and use a single mooring at the stern. 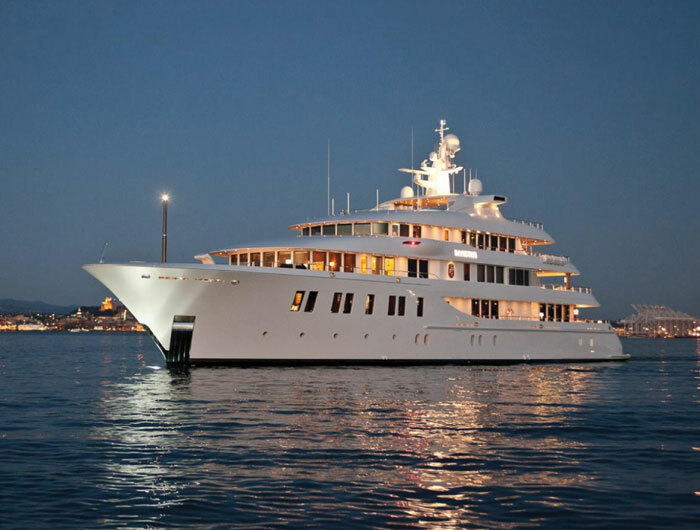 The mega-yacht mooring plan was approved with the condition that Marama use a stern mooring, so it will not swing. The permit can be revoked at any time. Both vessels will post a Notice to Mariners when the mooring is installed, abide by the city’s noise ordinance and be required to pay the city’s current pro-rated mooring fee. In other action, Harbor Commission members received an application to remove and replace the dock and boardwalk located at 3388 Via Lido. The boardwalk will be replaced to maintain public access along the waterfront and newly installed slips will be assigned to two residential units in the mixed-use project. Approved by the Newport Beach Planning Commission and the city council in 2011, the building renovation consists of converting a commercial bank building into a mixed-use project that incorporates both residential and commercial use. The three upper floors of the building will house two residential units, while the first and second floors will remain office and retail space. Nine parking spaces are provided for commercial tenants; one single-car garage and a pair of two-car garages will be assigned to the residential units. As submitted, the application requests the removal and replacement of the existing 4,099-square-foot floating dock and boardwalk. A new 3,518-square-foot floating dock, platform/landing, 3- by 24-foot gangway and a 6-foot-wide public boardwalk will be constructed. Six slips will be reduced to two larger slips with the capability of accommodating vessels up to 110 feet in length. Additionally, the old concrete pilings will be removed and replaced with 11 new concrete pilings. The revitalization plan also eliminates encroachment that previously occurred on neighboring properties, since the permittee was granted a residential pier permit that requires a 5-foot setback. The company doing this project also owns property at 2300 Newport Blvd., which is currently under construction for mixed-use development and a new marina. The commission also voted to revoke three moorings after permit holders failed to pay annual rental fees. The mooring permittees who failed to pay the fees had reportedly been contacted by city staff members at least eight times. The revoked moorings will be offered to boaters who are currently on the mooring waiting list.